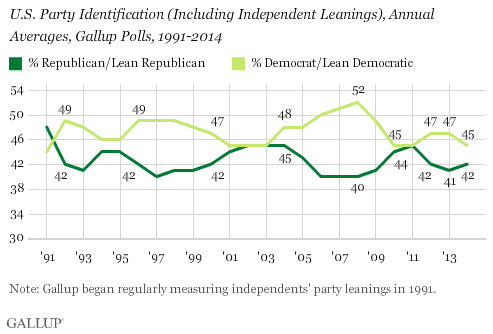 Gallup reported Wednesday that 43 percent of Americans identify as political independents — a record high. Thirty percent call themselves Democrats, and 26 percent call themselves Republicans. So what does this mean for our political future? Absolutely nothing. Many of these independents are closet partisans. They say they are independent but consistently lean towards one party or the other. In Gallup’s latest survey, only 13 percent of Americans don’t favor the Democratic or Republican party. In other words, 87 percent of Americans prefer one party over the other, which is about on par with data since 1991. Political independence isn’t more popular, it’s just more fashionable. And there is little data to suggest that leaners are less partisan than partisans. According to the American National Elections Study (ANES), 92 percent of Democrats voted for President Obama in 2012 — just a tad higher than the 88 percent of Democratic-leaning independents who did so. Ninety-two percent of Republicans and 86 percent of Republican-leaning independents voted for Mitt Romney. In fact, the ANES found that fewer independent leaners voted for the opposite ticket than self-identified partisans who said they weren’t strongly attached to a party. Just 9 percent of Democratic-leaning independents voted for Romney, and just 9 percent Republican-leaning independents voted for Obama. Among those who identified with a party but not strongly, 15 percent of Democrats voted for Romney and 12 percent of Republicans voted for Obama. As Ariel Edwards-Levy at the Huffington Post has pointed out, the growing unpopularity of both parties likely has led to people not wanting to identify with either one. But when push comes to shove, these voters consistently favor one side over the other.